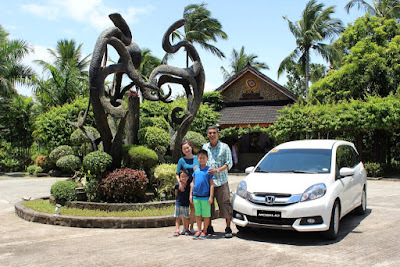 Honda Cars Philippines, Inc. (HCPI) travels to Anilao, Batangas together with the lucky winner of Mobilio 7-Smiles Away campaign. The Mobilio 7-Smiles Away campaign held from May 13 to June 30, 2016 allowed Honda customers nationwide to showcase their pride for the Honda Mobilio on Facebook or Instagram for a chance to win a road trip of their choice. Among all the participants that joined the campaign, the entry of the Gaston family impressed with their creativity and notable love and support for Honda’s first Multi-purpose Utility Vehicle (MUV). HCPI took joy in accompanying the Gaston family to their destination of choice at Vivere Azure Resort in Anilao, Batangas. The Gaston family traveled with ease and comfort to their dream vacation driving their own Mobilio. The New Mobilio comfortably fit the Gaston’s family of four, with the third row flexibly folded to provide maximum space for their suitcases, picnic basket, foldable bike, and other commodities needed for their trip. Furthermore, the Gaston family smoothly traveled through different road conditions from Marikina all the way to Batangas with the New Mobilio’s effortless handling and highly fuel efficient engine based on a 1.5 liter i-VTEC engine mated to a Continuously Variable Transmission (CVT) developed under Earth Dreams Technology. The New Mobilio not only stands out with its contemporary styling, but also with its superbly spacious cabin, interior flexibility, and advanced set of technological and comfort features. The New Mobilio is now available in new colors, including Brilliant Sporty Blue, Modern Steel Metallic, and Lunar Silver Metallic.